Thrift stores can be overwhelming, especially when you're looking for pieces to update your closet instead of just browsing for fun. 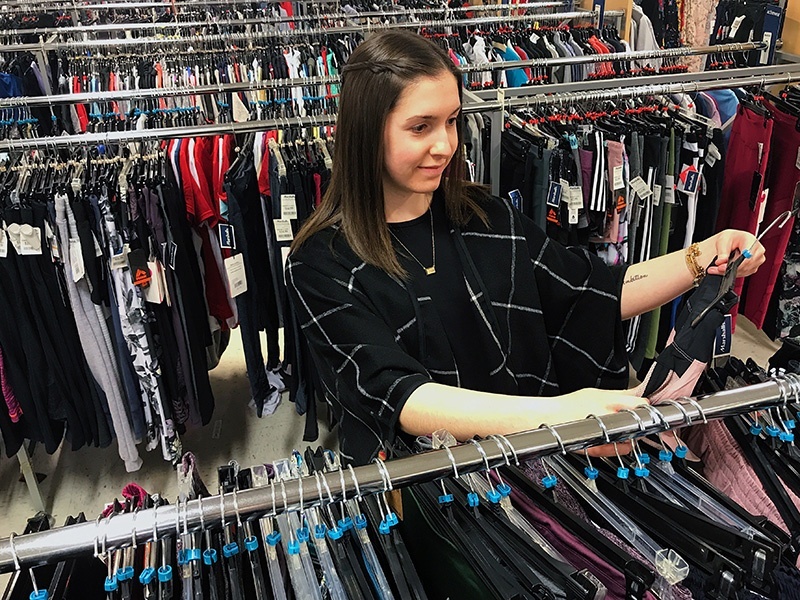 To make the experience less stressful and more productive, I put together five tips to help you get the most out of your spring shopping trip to Goodwill. These are tricks I've picked up on over the years and still swear by as I shop today! It's not the best idea to walk into Goodwill without any ideas of what you are looking for. Sure, you never know what you're going to find! But even with that thrill of hunting for the unknown, it's good to keep in mind specific pieces or outfits you may be looking for. If you really need to add a suede mini skirt to your wardrobe, spend extra time digging through the skirt section looking for what you need. Make a list of the specific items you're hunting for. You can also get outfit inspiration on Pinterest. Create a "spring fashion inspiration" board and add images of outfits you would love to recreate. You can hunt for similar pieces at Goodwill and put together your own spring look. This may sound crazy to the thrifting newcomer, but it's so important to dress comfortably for your shopping trip! If you are hunting for a new seasonal wardrobe, you're going to spend a lot of time on your feet, digging through racks and trying on clothes. I usually wear a pair of cropped athletic pants with a lightweight t-shirt, comfortable gym shoes and my hair in a messy bun. If you don't dress the part, you might feel overheated or uncomfortable which leads to anxiety and frustration. I'm speaking from experience here so TRUST. ME. The more comfortable you are, the more time you can spend hunting, which will overall lead to a more successful and enjoyable experience. Depending on your Goodwill store, some locations keep all pieces out all year long, and others will pack away clothing items that don't apply to the season. If it’s all out, you should make a game plan for which sections are your spring priorities. So obviously, sweaters, coats and long sleeves are OUT. This is also where the "get inspired" tip comes into play. If you create a list or have ideas of what you are looking for, you know which sections to hit up first. I personally check out the shoes and handbags first before making my way to the clothes. For the spring, my "priority sections" are dresses, skirts and blouses. If I have time, I like to peek at the denim as well. What are your spring priority sections? Just like it's a good idea to go in with ideas of specific pieces you want, it's also helpful to know which colors you prefer to wear. Goodwill color coordinates their sections which can save you a lot of searching time if you know which colors you are looking for! Did you know your favorite brands also have specific color palettes they work with? If you are very familiar with a certain brand, you might recognize an item just by the color shade. For the spring, I like to look through the yellows, purples and pinks. I love working pastels into my outfits this time of year. I also search for light blue hues like chambray and crisp whites. Whatever your favorite color to wear is, go there first! And don't be afraid to branch out with patterns, such as florals and stripes. Although you are most likely already getting an awesome deal, Goodwill also has colored tag sales on certain days of the week. Look for signs or ask an employee if they are offering any discounts on the day you stopped by. Usually a tag discount can be anywhere between 20-50% off the marked price. Deals on top of deals! It's always exciting to find out the dress you were so pumped to find is actually $2.99 instead of $4.99! These tips are tried-and-true in my book, so the only thing left for you to do is stop by your local Goodwill!